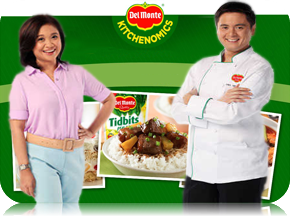 Since 1984, consumers have been benefiting from the "Kitchenomics" program of Del Monte Pacific's major subsidiary, Del Monte Philippines, Inc. Kitchenomics has been designed to generate loyal consumption of Del Monte products by providing cooking enthusiasts with meal planning tips and recipes that are economical, delicious, nutritious and easy-to-prepare! Picadillo is a traditional dish in many Latin American countries and the Philippines (where it is known as giniling, and also Arroz a la Cubana) that is similar to hash. It is made with ground beef, tomatoes (tomato sauce may be used as a substitute), and other ingredients that vary by region. 1. saute garlic, onion and pork until light brown. Add corn, DEL MONTE Original Style Tomato Sauce, 5 cups water, soy sauce, salt and pepper to taste. Simmer for 30 minutes. 2. add carrots and continue simmering until corn is tender. Stir in beaten eggs and malunggay leaves. Simmer for 2 minutes.